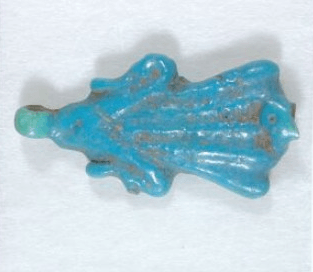 Question of the Week: What is Egyptian Faience? Many of the most noticeable objects in the Petrie Museum’s collection are a striking blue. Visitors are often surprised by their brilliance and ask me whether these objects, thousands of years old, have been recently repainted. They haven’t; they’re part of an ancient Egyptian material called faience. Faience was commonly used for small objects to be worn—such as amulets and beads—as it is smooth to touch. In many cases, these objects are quite similar to glass: the technique involves crushing quartz or sand and applying a soda-lime silica glaze. While faience is often studied and discussed in relation to pottery, in actuality it’s a type of ceramic, most popularly glazed in blue. I’m often asked if the amulets are made of lapis lazuli, an intensely blue semi-precious stone favored throughout the ancient and medieval worlds. (Ground-up lapis is the source of the color ultramarine.) Blue faience was viewed as a substitute of sorts for the more precious lapis and the objects in the Petrie collection are more frequently faience. Faience may have been produced in Armana, the short-lived capital city built by the Pharaoh Akhenaten and the site of one of William Flinders Petrie’s most famous excavations. While Petrie did not find the remnants of any actual faience kilns, he did find a multitude of artifacts which are now on display in his namesake museum. Unsurprisingly, faience is popular in museum displays due to its shockingly blue hue; you can stop by the V&A and spot this famous sceptre or pop into the Met and say hi to “William” the blue faience hippopotamus—other artifacts that also use the faience technique. Once you start noticing all the faience, you just can’t stop. Nicholson, Paul T., and Ian Shaw. Ancient Egyptian Materials and Technology. Cambridge: Cambridge UP, 2000. Stevenson, Alice. The Petrie Museum of Egyptian Archaeology: Characters and Collections. London: UCL, 2015.